A guide-quality felt-soled wading boot that provides the support, traction and durability you need to negotiate varied river beds and the trails that get you there day in and day out. 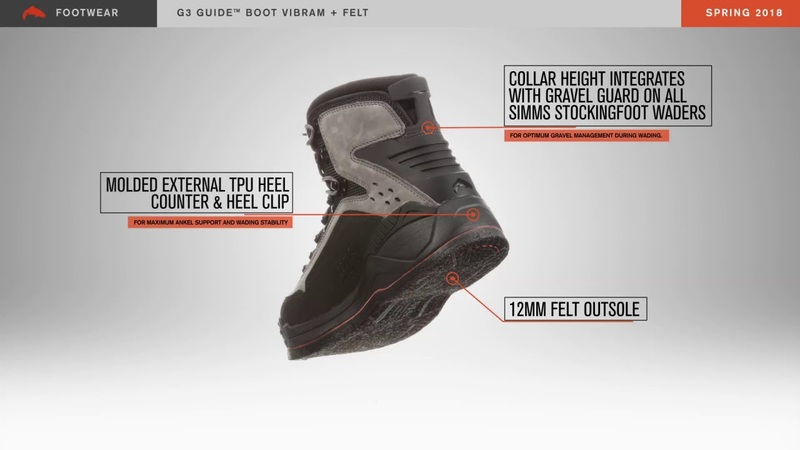 To allow proper room for the neoprene stockingfoot, find your regular shoe size in the right-hand columns and order the corresponding Simms Boot in the first column. This will typically be one size up from your normal shoe size for men and one size down for women (ie: a women's USA size 8 would take a men's boot size 7). Time spent on the river is knowledge. And the more time you spend on the river, the more your gear needs to perform at a high level. Our G3 Guide™ Wading Boot is designed with working guides in mind. This means the support, traction and durability that 200-plus days on the river demand. The boot features big-time ankle support and an enhanced feel underfoot to help you get to hard-to-reach places. Our RiverTread™ build gives you more feeling under your boot, so the unseen becomes easier to navigate without compromising on the overall support or traction of the boot. With proven durability to handle the wear and tear of hiking and wading day in and day out, the G3 Guide™ Boot gives you confidence to move across rocky river bottoms anywhere in the world. Guide boots are made of water-repellent full grain Nubuck leather. They require little maintenance but should be cleaned and dried. Store boots in a place where temperatures are stable and normal. Do not store boots in attics, garages, car trunks or any unventilated spaces. Never put boot in washing machine. My first pair of wading boots were made by Redball. They were nothing more than Chuck Taylors with a micro layer of felt. They did not last long, nor has any boot I have tried, and I have tried them all: Borgers, Danners, Orvis, Patagonia, Korkers and even some of the first Simms boots. Some worked better, some failed out of the box. 40 years of marginal joy. Last year I upped my game and purchased a pair of G3s with a felt sole. I added spikes. 200 + days on the water and I could not be happier. The overall weight of the boot is complemented by durability and support. Looking at the boots you can see they are well used, the spikes are worn down to nothing. The upper and the felt sole are as solid as the first day on the water, and they feel as good as the second day I wore them (it took a day to break them in). Getting into the boot at the start of the day is as easy as it gets. I tie the laces once and they are good to go. The sole has some flex, making it easier to wade the cobble. Where the boot really performed was on the steelhead rivers. The basalt bottom on the Deschutes and Grande Ronde shreds wading boots. The G3 held its ground with minimal scarring. I found my feet were in better shape at the end of the day. The first year in many that my big toe survived with no bruising. As I get older, I find it highly important to have confidence wading the rivers. I waded with confidence last year, a confidence that has been lacking. 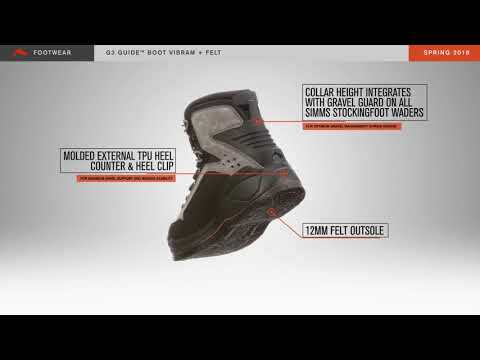 The G3 boot is worth every penny. I recently bought two pairs of these G3 Guide boots (one felt and the other Vibram) and they are great and very comfortable. I have one small issue with them though, the clip to attach to your waders is in the wrong place and should have been much nearer the toe end of the boot rather than half way up the laces. Great idea but just doesn't work due to being in the wrong place. Otherwise I am very pleased with them.